I rarely wear prints, but I couldn't resist this Eiffel Tower graphic top. It's my way of saying "I love you Paris!" This top is made from a luxurious poly spandex knit that is so comfortable. There are subtly placed tiny rhinestones on the front. The black, white and gray design covers the front and the back. It has three-quarter length dolman sleeves so I will be wearing it almost year round. I found it at BodyLanguageByConnie.com. I paired the top with a cashmere cardigan from J.Jill and slim fitting dark wash jeans from Fabrizio Gianni. The boots are very old by Nine West. The bag is by Zac Posen via Saks Off 5th. Since we were going to a casual brunch at the Grove Park Inn, this was the perfect look for our full day of leisure. I couldn't resist asking this beautiful grandmother if I could take her picture. She wore the perfect look for a day with her family admiring the gingerbread houses and Christmas trees on display throughout the resort. Sitting in front of one of the fireplaces in the Great Hall at the Omni Grove Park Inn is such a pleasure when the weather turns cold. There is always something fun going on at the Omni Grove Park Inn! The holidays are now in full swing! There are decorations everywhere you look. I use mindful eating and discipline rather than being deprived of the things I enjoy as techniques to control my weight. A great coach once said, "Your attitude is always the most important part of the game of life." Do you go shopping on Black Friday? Wild horses could not drag me to a store on this day! I am not a fan of crowds or shopping so I stayed home and cleaned my house and went for a walk because it was a warm sunny day here in east Tennessee. I did ride along with Mr. Mickey at the end of the day as he ran a few errands such as going by the Mercedes dealership to pick up a part. After completing my chores, I slipped into an average daily look for me. That is an old jacket from Express, the V-neck tee is from T.J. Maxx last year, worn with old boyfriend jeans from Chico's. The fringe suede shoes are by Steve Madden via Macy's. The bag is by Zac Posen via Saks Off 5th. I do wear white pants, jackets, and blouses all year long on sunny days. That old no white after Labor Day rule has been laid to rest. My hair looks a lot more controlled here because I used a new product by Moroccanoil. It smooths and conditions as it defines your curls. I haven't gotten used to using it yet. I forgot to fluff my hair after it dried so this look is too controlled for me. I do like a bit more of a messy look. I will get the hang of it. For those of you who have asked me for tips on posing for photos, I will share my top ones. I don't always have these in my mind while we are shooting, but they do make me look my best when I follow them. 1. Stand up straight and tall. 2. Don't shoot in the full sun. Move both the photographer and you to a shady spot. To avoid the fish eye effect, have the photographer stand a few feet away from you. Mr. Mickey was almost too close in the first three photos, making my legs look shorter. 3. Turn your body away from the camera while you turn your face toward the camera and place your feet at different angles. 4. Lift your chin and smile an easy small relaxed smile. A big fake smile always looks like a big fake smile. 5. Look into the lens or slightly away from the camera. 6. Relax your hands and tilt your shoulders back slightly. 7. Practice looking confident and comfortable in front of the camera. It will always show in your pictures. Confidence is the greatest accessory! Eat Smart Even on Thanksgiving! After my last post a few days ago, there were lots more questions about food. Yesterday was the great American food and family celebration so I am sharing my tips for successfully navigating this type of event. For some of us, this is the start of the overeating season. 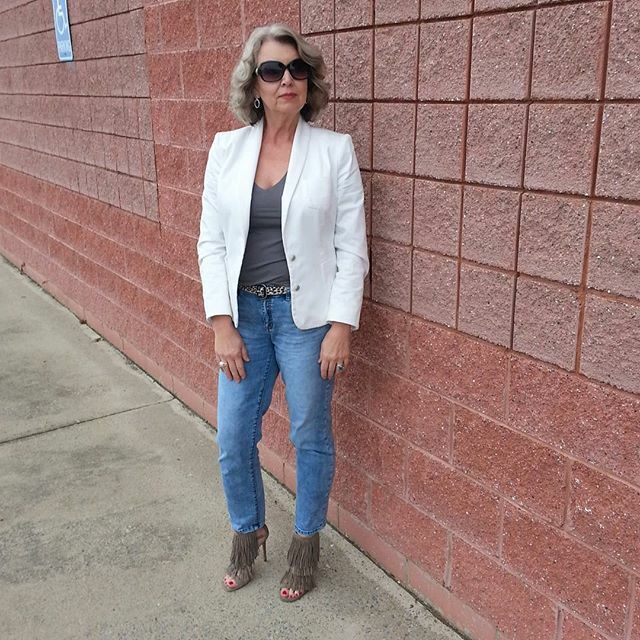 I wore my slimmest fitting straight leg jeans from Loft with a white tank top by Peck and Peck via Stein Mart topped off with a luxurious faux suede shirt by IC Collection from ShopMyFairLady. I have often said that tight jeans saved my life. When I wear yoga pants or other stretchy comfortable slouchy pants day after day, it is so easy to gain a few pounds without being mindful of it. Before you know it, you have ten or more extra pounds! I have a French friend who tells me she never weighs herself. "When my clothes start to feel tight I eat less for a few days." This was a casual family gathering so I limited the accessories and makeup to a lighter daytime version with one ring and a statement of arm candy. The bracelets have been collected during my travels. That's my favorite YSL lip gloss and an animal print clutch from Express. The boots are by French Connection via Saks Off 5th. My sweet sister prepared a delicious meal for our family. She is an awesome cook! We enjoyed a perfect day together sharing memories, laughing and talking. As the sun was starting to go down on this bright beautiful warm day, I snapped this photo of a deer eating in a meadow on a hill. These are my own important points to remember at these special meals which will likely be happening a lot in the coming weeks. I never eat until I feel really full. When I know I will be sitting down to a special family meal later in the day, I eat a very light small breakfast. The size of servings can quickly become overwhelming so I always serve myself only one spoon full of the items I want to enjoy. It all tastes the same so why pile a lot of each item on your plate and then be miserable later? My food choices throughout the year include fresh organic and local vegetables and fruit available at my local grocery stores. I keep an open mind when I shop and just look for those items that look most appealing at the time. My goal is to eat these foods every day. These items do nothing for our health. I eat them in very small quantities on very rare occasions if ever. Some foods or ingredients can be the trigger that cause headaches, body aches, and inflammation and bloating. I avoid preservatives, processed foods, and meat because my body does not respond well to these items at all. Sodium tripolyphosphate known as STPP is one such trigger that will bring on a severe migraine for me that lasts for two days. It is a toxic poison for some people and yet the United States Food and Drug Administration lists STPP as "generally recognized as safe". I do NOT trust them to make these choices for me. It is wise to find out which foods, additives, and preservatives cause you problems and to eliminate them from your life. My goal when I started this journey five years ago was not just to lose weight. I wanted to eliminate those migraines and the inflammation that was causing me so much pain I found it difficult to walk at times much less wear high heels. A wonderful side effect was that I lost more than forty pounds and gained a tremendous amount of self-confidence along with a robust healthy immune system. I enjoy sharing fashion tips with you, but it is much more important to me that I convey how vital it is that you take care of your body so that you can enjoy your life. A friend of mine who is a heart specialist was discussing this a few nights ago. She said, "Many of my patients live their lives without taking care of themselves at all and then when the heart starts to fail they want me to fix it." A feature in Harper's Bazaar magazine that I always enjoy reading is "24 Hours With ______". (Fill in the blank with a famous fashion personality or actor.) There are certain questions I get asked all the time, so I thought answering them all here using that format, might be fun. Miss Elaine brush back satin pajamas from Belk are my all time favorites! My typical day starts at about 4:00 AM. That's when I naturally wake up. I rarely use an alarm. I make a cup of coffee and go back to bed where I slowly sip the coffee and think about all the things in my life I am grateful for. Every day is Thanksgiving for me! 4:15 AM. I don't touch my phone or my computer until I have enjoyed the ritual above. Answering emails and resolving issues takes about two hours every morning. I read the New York Times online and some of my favorite blogs as well as scrolling through my Facebook feed. 7:00 AM. I fix breakfast and listen to NPR on the BOSE in the kitchen. After those first two cups of coffee, I switch to hot tea. I drink a lot of filtered water with lemon (no ice) during the day and normally with each meal. I also enjoy adding Bragg's Apple Cider Vinegar and cinnamon to my water at least once each day. When the weather is nice I will go for a long brisk walk around the neighborhood after breakfast. Otherwise, I am very active all day and work as much movement into my day as possible. Take the stairs many times a day. Park far away from the building and walk. Walk around that big box store several times at a good pace before you pick up what you came for. 8:00 AM. After cleaning up the kitchen, I make the bed and take a shower. My hair is naturally curly so I don't wash it every day, but I will rinse it and then comb it out with a pick or wide tooth comb and just let it air dry while I put on some makeup. My makeup routine varies, but I always put on eyeliner. I use black Almay liquid eyeliner at the moment. The liner goes into the base of my lashes and on the waterline underneath my top lashes since that upper waterline becomes more prominent as we age. I never put even mascara on the bottom lashes because any darkness there looks too harsh on me. I fill in my eyebrows with a blonde LANCÔME self-sharpening pencil. I always do my eyes first because that saves from having to correct any flakes or smudges from eye makeup. I use a darker shadow color in the outside corners of my crease and blend well. Never use a shimmer on the brow bone as we did in high school. That is really not a good look for us now! I wear a bright (not dark) red lipstick and lip pencil every day. The tone of red will be determined by the color of the top I wear. I line my lips and also fill in the full lip with the pencil before applying the lip color with a brush. I blot the color well and apply a bit more in just the middle of my lips and blot again. Staining my lips rather than having color sliding around on them is my goal. If your lips are often chapped and dry it is because you need to drink more water. I always blend all color really well and use a light touch. I strongly suggest that you go to the makeup counter and ask for your foundation to be correctly matched to your skin tone in natural light. That is the only way I know of to get the right color. 9:00 AM. I get dressed for the day. What I wear depends upon the weather, my appointments, and my mood. I normally start each look with shoes and then build from there. I have been wearing high heels for most of my adult life so I do wear them almost every day. Getting dressed takes ten minutes tops. By now my hair is usually completely dry so I comb it out one last time and forget it for the rest of the day. My day may include a photo shoot, business meeting or other appointment, errands or a visit to my warehouse to meet with my team of superwomen. I have the greatest staff ever! 2:00 PM. I normally eat only two meals a day. I eat very nutritious foods that keep me from feeling hungry in a couple of hours. Lunch will include several types of dark leafy greens, beans, mushrooms and any other in season steamed or baked vegetables I have on hand. For dessert, I have one small taste of gourmet dark chocolate almost every day. I sit down to a properly set table and nice music in the background while I take my time and thoroughly enjoy each meal. Think of food as fuel for your body, not entertainment for your mouth. A few years ago, I read the book "Eat to Live" by Dr. Joel Fuhrman to learn more about nutrition. In the process of getting healthy and building my immune system, I lost more than forty pounds. I have kept it off for about five years with no dieting. If we do go out to dinner I will order a salad or other vegetarian entree and a glass of wine. Being with friends and enjoying getting dressed to go out is my focus. Not the food. It is normal for me to work until 7:00 PM because in addition to this blog I own a company which I am still very much in control of. There may be orders to place, ad materials to write, new shipments to photograph and website content that needs to be updated. I start to unwind and relax after I turn off the computer and plug my phone into the charger in the kitchen. There are always household chores that need to be done. I wash my face with a good cleanser every night without fail. My skin behaves best when I add moisturizer only in the morning. I do some stretches or balance exercises before dressing for bed. Cranberries are so good for you! Did you know they have Vitamin A, Vitamin C, Iron, Vitamin B-6, and Magnesium? 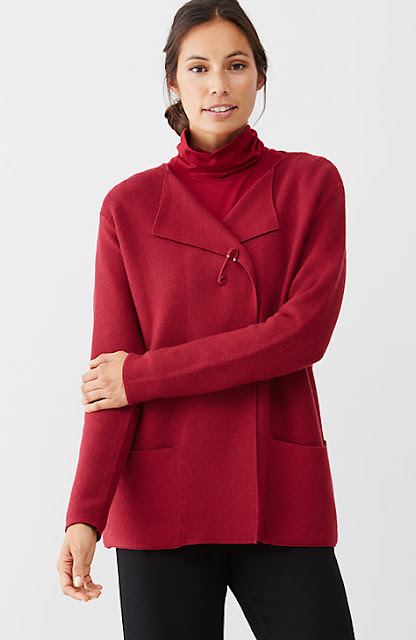 The moment I saw this cranberry colored cardigan, I knew it would be good for me too! I have to admit I have gone a little crazy for J.Jill items lately. Their December collection includes so many items that fit with my personal style. I have already worn this cardigan a couple of times. The color is so rich and the fabrication is very elegant. I can literally wear it with almost everything in my wardrobe. It is shown on the J.Jill site with a turtleneck in the same color, but I love the fact that it looks good with almost every top I own. They have a 25% off sale going on right now so I think I'll go back for this in black also! I value items that can be worn in several ways so there are only a few dresses in my closet. This very versatile dress from J.Jill is one that I can wear alone or layered for different looks. On this windy day, I wore the dress with black Spanx tights and long boots from Vince Camuto. Next I added a necklace from Chico's a couple of years ago and a long faux leather trimmed vest also from Chico's. 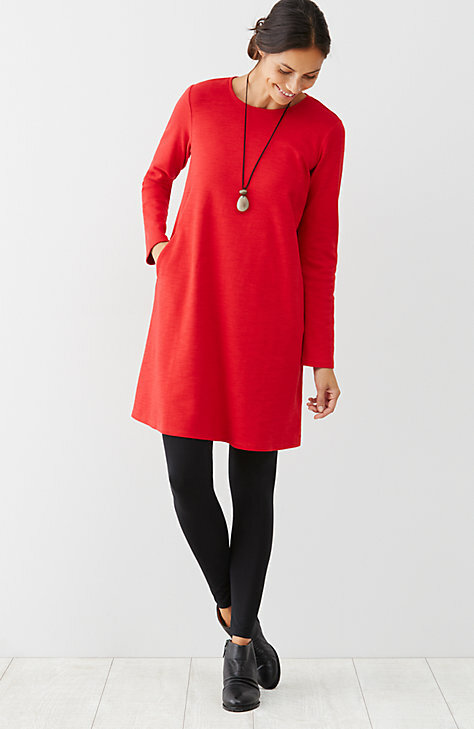 This J.Jill dress can also be worn with leggings and short boots as it is shown on their site. This 100% cotton knit fabric is very warm and soft. I love how it flows across the body without clinging to any of my jiggly bits. This dress is a winner! I am so glad I added it to my fall wardrobe. Modeling for in-store style shows at my local Chico's is always a treat for me. There is always a great selection of beautiful statement jewelry to complement each item in the Chico's boutique. If you are shopping for anything from stunning evening cardigan to a great looking faux suede vest to wear with jeans, you will find a selection that is perfect. Eggplant is always a fabulous color choice! Katherine Roach is the assistant manager of the store. She does such a great job presenting the clothing we show. The beautiful lady to the right of me in the photo above is Kathryn, a Fifty, not Frumpy follower who came up all the way from Greeneville to visit with me and watch the show. It was so much fun to meet her! The excellent staff of the store did an amazing job putting together the show and providing snacks for everyone. This beautiful little four-year-old girl was such a delight! She was shopping with her mother, grandmother, and great-grandmother. She thought the fashion show was the best thing ever. I think she had more fun than any of us! The kickoff for the holiday season here in Johnson City is the "Spirits of the Season", an American Cancer Society event generously presented by One Stop Wines and Spirits. This year the special event was held at the beautiful Johnson City Country Club. 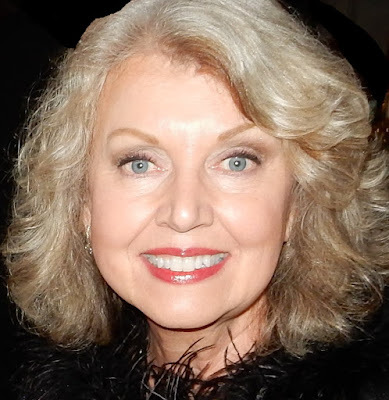 I wore a black sequined and feather adorned sweater which was a gift from my dearest friend, Mitzi. The pants are from the Traveler's Collection at Chico's. The suede heels are from Saks Off 5th. This is a wonderful social event with fine spirits, food, and friends! My dear friend Maribeth, on the right, wore Christian Louboutin shoes. She was impressed that Mr. Mickey knew the brand and asked to photograph them. I celebrated the evening with two of my favorite cancer survivors, Jennie above and Mr. Mickey below. The purpose of this event is to help raise awareness and funds for the American Cancer Society. Fabrizio Gianni Knit Top Giveaway!